Most sources consider this a self portrait. According to my trusty book; 50 Women Artists You Should Know (Weidemann, Larass, Klier, Prestel Publishing, N.Y, 2008), Not a whole lot is known about this artist. She was born in the Netherlands about 1594. She is credited as one of the founders of still-life painting with her first known work at age 14! Like so many women in the history of the world, not much is recorded. It is surmised that she was under the guidance of a studio or apprenticed to a master. There are about 80 known paintings of hers that have survived, she had signed at least 30 of them. 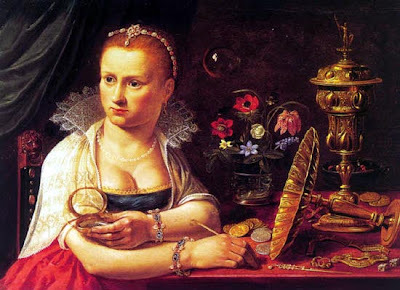 Her final painting was dated 1657, and is now lost. The circumstances of her death are unknown. Some of the images of her paintings that I have seen show beautiful and rich detail. Unfortunately, they don't show up as well here but I will try it anyway. Her still-lifes are exquisite with incredible attention to detail. One of her most famous is Still-Life with Fish and Cat. 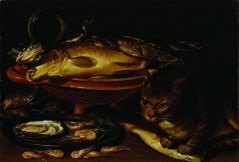 Clara Peeters, "Still Life of Fish and Cat," n.d, Oil on panek, 13 1/2 x 18 1/2 in. I searched for a good image but was not able to find one of good enough quality to do it justice. The descriptions on various websites and the picture I have in the book show beautiful and skillful work.I find it rather frustrating that so much of her work is spread so thin and details about the paintings seem to be rather sketchy. I would love to see a major exhibition of her work. So, after checking Clara out, here is a bit of my humble work. 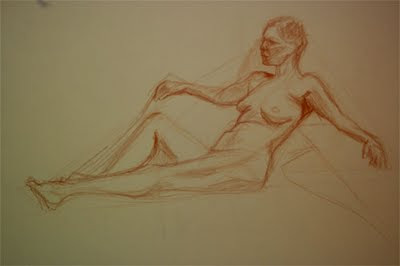 All I have to show this week is a 30 minute life drawing sketch. While I am grateful for still life sessions here in our little town and only 4 blocks from my house, I must confess, I do miss so very much 18 and 24 hour poses. Here is my sketch which was done with earth brown pencil on drawing paper. 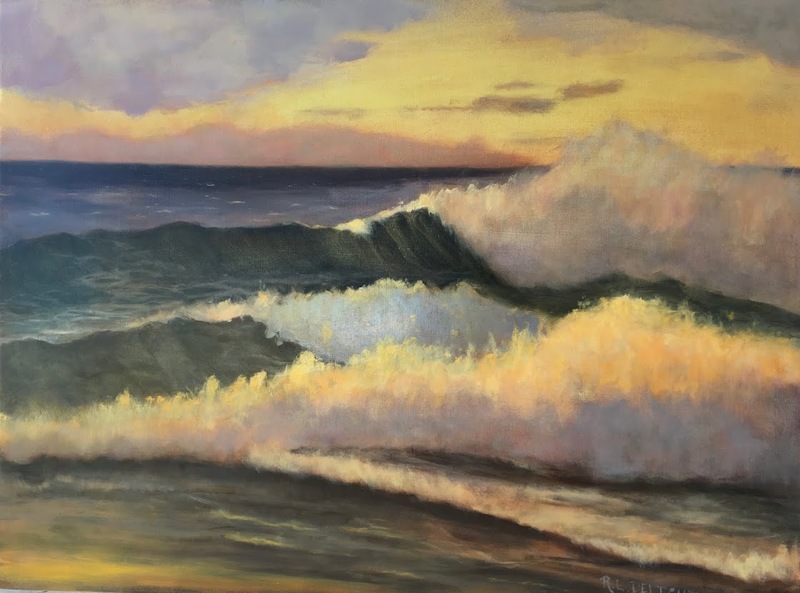 The next couple of weeks I am going to be painting like mad to see if I can get a couple done for two local group art shows. I am continuing to work on the charcoal portrait of my husband. Should be an interesting and busy week! P.S. For some reason Blogger is playing games with my font and size. Sorry for the weird reduction and change.